More info:From £1150 - £1199 excluding flights. Prices based on 2 adults sharing. Single supplement available. Mimimum age 14. 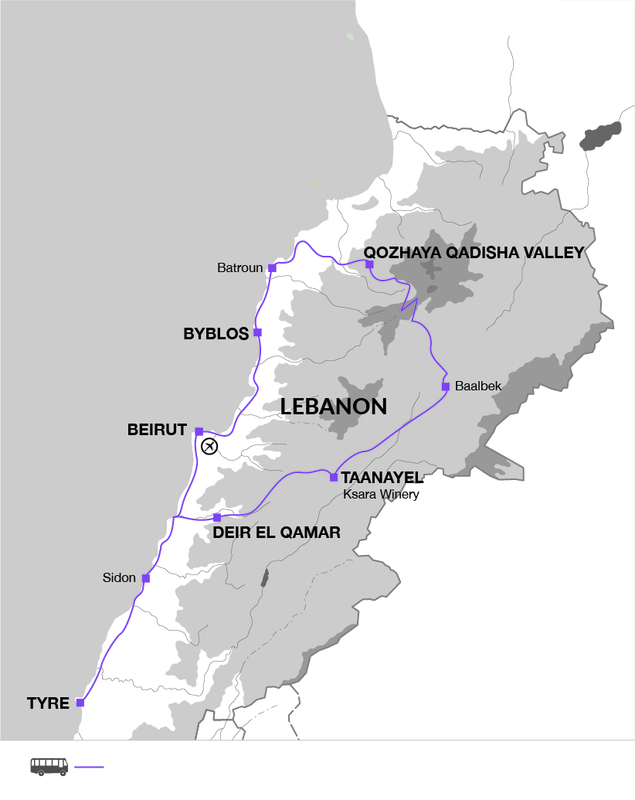 Lebanon is a small Middle Eastern country with a variety of different landscapes and terrains, and we are very keen to conserve this beautiful country. While we travel between cities by bus, we do the majority of our sightseeing on foot. Spending time exploring ruins from the Phoenician, Roman and Byzantine eras and then strolling through the narrow lanes of the souqs. All of our leaders have been trained on how to promote responsible tourism, particularly focusing on reducing the use of single-use plastic. On this trip the leader will advise you where to refill water bottles with clean, safe drink water, therefore reducing the necessity to buy plastic water bottles throughout your trip. Travelling in Lebanon means you are rarely far from a coffee seller or a stall selling fresh fruit. We regularly stop and make the most of the chance to chat to the sellers whilst we enjoy some strong, sweet, black coffee. During this itinerary we spend one night in a simple hotel in the grounds of St Anthony's Monastery. The money from our stay contributes to the maintenance of this beautiful building dating back to the 4th century, set in the fertile Qadisha Valley.